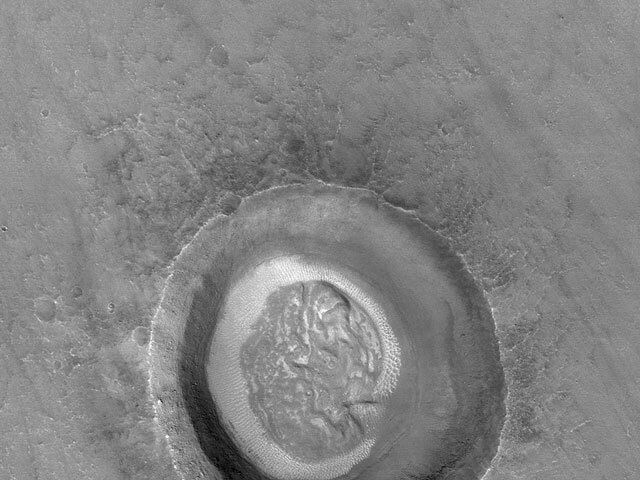 Explanation: What caused this unusual looking crater floor on Mars? Appearing at first glance to resemble the human brain, the natural phenomena that created the unusual texture on the floor of this Martian impact crater are currently under investigation. The light colored region surrounding the brain-textured region is likely sand dunes sculpted by winds. The Mars Global Surveyor robot spacecraft that has been orbiting Mars since 1997 took the above image. Meanwhile, down on the surface, robots Spirit and Opportunity continue to roll, inspecting landscape, rocks, and soil for clues to the ancient watery past of the red planet. Humorously, this brain-terrain on Mars spans about a kilometer, making it just about the right size to fit inside the rock formation once dubbed the Face on Mars.